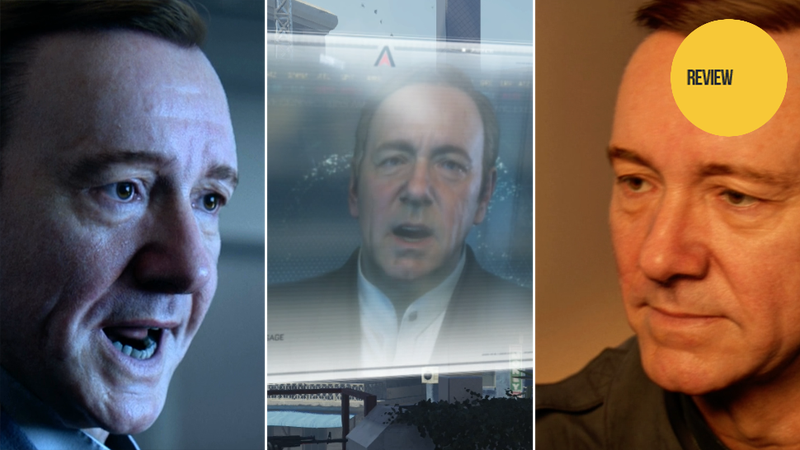 How is Kevin Spacey's performance in his big video game debut? That all depends on which of the three versions of Spacey Call of Duty: Advanced Warfare's campaign is serving up at the time. Warning — the videos below contain mild story spoilers. The least enjoyable of the three Advanced Warfare Kevin Spaceys, Mission Briefing Spacey feels like the actor is just sitting in a room somewhere reading lines. That's likely because he was sitting in a room somewhere reading lines, as opposed to moving about in full capture gear as he does in the more animated cutscenes (image via this Gamespot video). Spacey does his best with what he's given — notice the little head shakes and eyebrow raises he throws in there — but these remote briefings are just this side of Destiny-quality. The fact that Spacey's face(y) is obscuring the better part of a quarter of the screen doesn't help. He'd play a mean door, but a window? Not so much. Kevin Spacey does a mean seething menace. The way his face slowly tenses and the lines gradually change is an amazing thing to watch on film. Advanced Warfare's facial capture almost gets it, but not quite. Passionate Spacey skirts the edge of perfection, but never quite gets there. Then he tries shouting, and the illusion is completely broken. That "On my authority!" should have had so much more impact. This was the moment where I wished they'd just gone full motion video. Watch the video again with an eye for the other actor's performances. They feel much more nuanced and lifelike. They aren't, technically — Spacey is just such a highly recognizable talent with very specific mannerisms, which makes it easier to spot discrepancies between his performance and the 3D model's. The best Kevin Spacey of the bunch comes out when Kevin's digital doppelganger is doing what Kevin does best — just talking. Kicking back with the boys, sharing some poignant piece of wisdom. Sitting on the front porch with a mint julep. Discussing back-room politics. Spacey simply talking commands attention and respect in the most gentle of ways. Not doling out orders. Not shouting down high-ranking military officials. It's in the rare moments like these that Kevin Spacey sells himself as the head of one of the most powerful private military corporations in the world. This is a man who inspired other men to follow his lead. All in all, not bad for a first attempt to enter the video game realm for Mr. Spacey. His performance is a little uneven, his in-game avatar doesn't always follow his voice's lead, but when they do sync up it's a little magical. As hyped as Spacey's appearance in the game has been however, the truly consummate performances come from voice acting and mocap veterans Troy Baker and Gideon Emery. They're familiar with the subtle differences between live and virtual performance, they're familiar with the capture technology, and they both basically nail it. If Kevin Spacey keeps at it, one day he'll be as good a virtual actor as they are. Look for our full review of Call of Duty: Advanced Warfare on Wednesday, once we're done getting shot at.